Super quick little Sunday post. Sunday Post? Ugh. Whatever! : P Also, if you haven't entered our giveaway yet...hurry! You've only got a day and a half! Today I have two stragglers from Fall. Someone very nice knew I couldn't find Port-Folio locally and sent me a mini of it...and First Looks too! They're from the In True Fashion collection. I wanted Port-Folio soooooo bad and I love how it shifts! The formula startled me. It went on thick and then bubbled, which really upset me because the shift is so gorgeous. Then it mostly flattened out after I applied a quick dry topcoat. I've never seen that happen! I know minis dry out quickly, so I'll probably thin this before I use it again. It's just so gorgeous!! 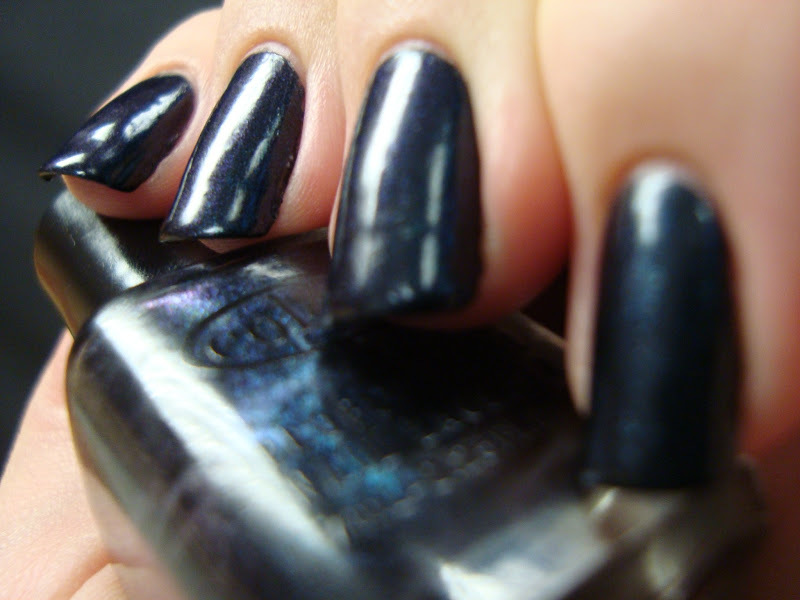 First Looks is a shimmery dark dusty blue with just a bit of purple shimmer and shift. First Looks did the same bubble thing, flattening out a lot as it dried. So odd! Is this normal with Color Club? I've barely worn them. I'll probably thin this too. ....and it doesn't look black under normal lighting! Yay! I have one more pair of fall stragglers and some kind of Thanksgiving thing maybe, but otherwise the next few weeks are gonna be xmas and sparkles and Chanukah and more sparkles! I might have to stalk Port-folio on ebay now...... Beautiful!